Africa is changing – radically – and digitization is playing a pivotal role. On this continent that has the world’s youngest population, digital practices are emerging that transform Africa’s societies and their global perception. 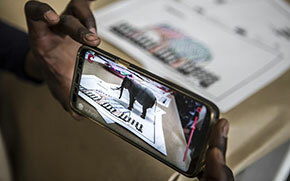 Apps and digital content developed in Africa are increasingly entering the global technosphere. African digital infrastructures meanwhile remain marked by local and global asymmetries despite the widespread use of mobile phones. New forms of digital inequality are accompanying the rise of a number of well-connected digital hubs and scenes. African digital innovations and practices still rely on infrastructures dominated by the Global North, and increasingly also by China. The exhibition and research project »Digital Imaginaries«, which was developed in collaboration with partners in Dakar and Johannesburg, takes this contradictory diversity of digital phenomena in Africa as its point of departure. Like the exhibitions, workshops, and events that took place in Senegal and South Africa as part of the project, the contributions now to be seen at the ZKM are by no means confined to describing digital transformations. Many of the works featured in this show engage with African histories, practices, and conditions to glean inspiration for emancipated digital futures that will withstand market-oriented interests and post-colonial hegemonies. Starting from artists’ positions which have developed in various countries on the African continent and in the African diaspora, the works featured in the exhibition articulate the necessity for more diverse, richer global digital imaginaries. Supported by the TURN Fund of the German Federal Cultural Foundation and by the German Federal Ministry for Economic Cooperation and Development.